I know what you’re probably thinking, you’re about to read a juicy story about how an online MBA student learned to kiss in grad school. Sorry to disappoint, but this post focuses on the more academic side of things. KISS, a common acronym in business, is short for Keep it Short & Simple. In other words, it means being succinct and to the point in your communication. Learning how to KISS is possibly the most valuable skill I learned while getting my MBA through Indiana University’s Kelley Direct Program. Since graduation a little over a year ago, I’ve been reflecting on what lessons stood out and have helped accelerate my professional growth & development. It is clear that being able to effectively communicate with my colleagues what I am thinking, doing, and have planned has become an invaluable asset as well as enabled me to efficiently achieve my business goals. We’ve all been on the conference calls where one person takes 7 minutes of a 30-minute phone call to outline why they called the meeting or what the situation was that they were hoping to address. Or, the email string that’s 42 messages long with no action items assigned. Who has time for that? In fact, you’ll often notice, that absolving yourself of these habits is a key differentiator to propel corporate success. 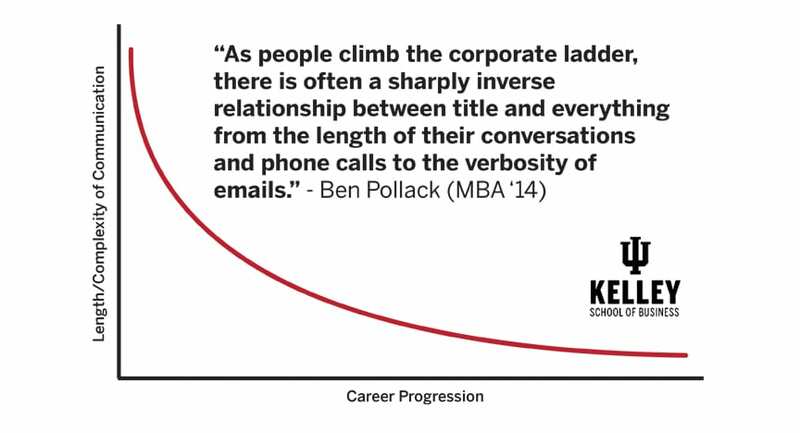 As people climb the corporate ladder, there is often a sharply inverse relationship between title and everything from the length of their conversations and phone calls to the verbosity of emails. This idea of learning how to KISS is essential not only to grow one’s career but also to improve your productivity and the quality of your contribution to the organization. The concept of being concise and getting to the point was at the very heart of my MBA experience, transcending most of my courses and team projects. Completing my MBA in a virtual environment provided a very unique experience, allowing me to collaborate and learn from peers in very similar situations. But unlike in a traditional full-time MBA program where students give all their attention to their education, my Kelley Direct classmates and I were managing a full-time career while completing our online MBAs. Time management was of the essence with only a few hours a day available for coursework. Applying KISS became critical to accomplishing my individual and team goals in each course. It quickly became apparent that neither my classmates nor professors had the discretionary time to read copiously long emails or explanations of topics. Getting to the point quickly not only makes others perceive you as better learned but helps others grasp your ideas better. I recall one professor saying “Always have an elevator pitch nearby and pretend that you’re talking to a 5th grader.” That advice has proven very true in many applications both in my professional and personal life. You often find that you need an interpreter or your colleagues paraphrase what you say in an email, meeting, or presentation to make sure they or others understand what you are saying. Your email strings are often 5 emails or longer with no resolution. Your colleagues frequently prioritize other meetings over ones you set up. Your emails cannot be read without scrolling. You need more than 3 sentences to explain yourself. 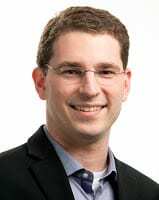 Ben Pollack is currently the Global Executive Director of Digital Marketing for Sealed Air Corporation, a Fortune 500 company which owns brands such as BubbleWrap. Prior to joining Sealed Air in 2014, Ben worked for Siemens in a number of global digital marketing roles for 8 years. Ben graduated from the University of Rochester with a Bachelor’s Degree in Psychology in 2010 and an MBA from the Kelley School of Business in 2014.